Kay Macaulife was born Kathleen Maud Roberts, in 1909, the daughter of Robert Frank Roberts, a woollen merchant, and Amy Maud Roberts, of Barnes, southwest London. Amy's brother, Ernest Abbott, was a professional actor. Kay grew up in Barnes, attending Putney High School for Girls. Both she and her brother Alan belonged to Barnes Sports Club, and were active in its Dramatic Section. In 1933, aged 24, she married another member of the Sports Club, Philip William Macaulife. They spent their honeymoon in Paris, then set up home, `Maxone', in Feltham, Middlesex, where I, their first child, was born in 1935. Their second child was born on 30 September, 1938. While Kay was in hospital in labour, she was measured for her gas mask. She expressed dismay at the prospects for her new baby, and was told, `Don't worry, Mrs Macaulife; when the baby is born it will be fitted with a little gas mask of its own'. In relief and gratitude at the Munich Pact, the Macaulifes christened their new son, Neville Philip. In World War II, while Phil and Alan were away serving in the Royal Artillery, Amy Roberts, by then widowed, with Kay and the two children, moved to the seaside village of Felpham in Sussex. Phil and Kay's furniture was stored in his mother's home in Barnes. Grandmother, mother and children lived together in "The Dutch House", Limmer Lane. Kay joined the Women's Voluntary Service, and worked with them throughout the war. I recall her serving meals at The Barn, Limmer Lane, wearing the green WVS (not then the WRVS) uniform. She worked too as secretary at Bognor Regis Town Hall. After demobilization, Phil and Alan both came to Felpham too. Alan, then unmarried, lived with his mother in `The Dutch House'; the Macaulifes sought a family home for themselves. Housing was in short supply, and at first they moved between places available only on short lease; one was in Links Avenue. At last they found their first house: `Hyperion', Davenport Road, on the Wedgwood estate, right on the coast. Access to the beach, though, was prevented by the rusting iron defensive barricade, which remained in place for years after the war's end. Both Phil and Kay joined the Falcheham Players, an amateur revue company that played in Felpham Village Hall. Producer and scriptwriter was Lyddon Surridge. Summer Funfare" in 1947 was the Falcheham Players' 55th production. Phil and Kay took part in the sketches; Kay also did impersonations of radio comedy characters. These included Jeanne de Casalis's feather-brained housewife, `Mrs Feather'; Mabel Constanduros's Grandma Buggins and her family; Mrs Mopp (`Can I do yer now, Sir?') and Mona Lott (`It's being so cheerful as keeps me going!') from ITMA; and Suzette Tarri (ending her impersonation of this comedienne by singing"Red Sails in the Sunset"). I sometimes joined her in child roles, such as Sophie Tuckshop from ITMA (`... but I'm all right now!') and Monica from Educating Archie (`She's my best friend and I hate her!'). What is the Kay Club? We have often been asked this question. Here is the answer. The Kay Club is a group of half-a-dozen women, all members of the Felpham and Middleton Branch of the Women's Institute. It was formed some months ago when Miss Kathleen Macaulife wrote a topical play and had it performed seventeen times before enthusiastic audiences. Finding that people liked to laugh at plays written about present-day problems, the Kay Club presented seven others, all topical and all written for the same little team. Up-to-date they have given over forty performances in every sort of hall for every sort of occasion. The members are all housewives, and fitting in rehearsals isn't always easy, but their enthusiasm for the play has overcome most of their problems, and if father's dinner has been cold he has found consolation in the Kay Club's productions. They have played in halls without curtains, stage, or proper lighting. They've used props they've never seen before the show, for anything too big to fit on the bikes they travel around on has to be borrowed on arrival. There have been other problems to cope with before a show could go on, yet they have never let an audience down; and as Miss Macaulife says: "We've collected a heap of memories and a lot of fun. We've made people laugh at their own everyday problems, which certainly aren't funny off the stage, and while we can do that I guess the Kay Club will keep going." On with the show, Kay Club. We are very interested in your productions and Mr. Will Honeycombe would like an invitation to your next. This will be "Now and Then". We hope to be able to publish some photographs of this production in the near future. Dr. Barnardo's Helpers' League had an enjoyable garden party which was held at Outerwyke Farm, Felpham, by kind permission of Mr. and Mrs. P. A. Norman, on Saturday. It was opened by Mrs. Claude Hulbert, who presented badges to members of the Barnardo Helpers' League. A bouquet was presented to Mrs. Hulbert by Jennifer Hazley. There were several stalls, sideshows and pony rides, which were well patronised and musical selections were played during the afternoon. A short play "My Hat" written and produced by Mrs. Kay Macaulife was performed by members of the Kay Club, the Folk Dancing Club, and the B.H.L., which was greatly enjoyed. The total sum raised was approximately £85. The hon. secretary, Mrs. J. D. Marks, and hon. treasurer, Dr. Helen Buckell, wish to thank all those who helped. Her daughter's diary for 1949 (when she was 13 years old) records seeing the Falcheham Players' production of "Funfare - by Request"; also seeing her in "Gaslight Gaieties", "a sort of revival of the old music-hall". On losing a pair of "Scotch socks" that she should wear in a pantomime, she wrote, "Mummy needs them for untold dozens of things in her various and numerous shows!" In 1949 the Macaulife family moved further inland, from Felpham to North Bersted, living in Norbren Avenue; and "Muv" Roberts moved along Limmer Lane to "Morwell", opposite the church. Kay took parts in productions of the Phoenix Players, the professional Repertory Company playing at the Roof Garden Theatre on the landward end of the pier at nearby Bognor Regis. After that Company closed, she became Secretary of the Company that established its successor, the Buskin Players. In later life she greatly regretted not having kept a diary through that period, feeling she could have written a splendid book on the setting up of a repertory company. "Kay Macaulife emulates Jekyll and Hyde by her changes from Secretary to Actress. Indefatigable and loyal Kay has been a tower of strength in the last year, as in the year before." In 1952 the Macaulifes left Sussex, moving to South Wimbledon, nearer to Phil's work in the London tea market. There Kay found work in Wimbledon Theatre box office, as a knitting machine demonstrator and as a Spirella corsetière. She continued her theatrical work as an actress with the Wimbledon Repertory Players, the Hovenden Theatre Club in Covent Garden, Langley Radio Theatre, Merton Park Townswomen's Guild, and Carlton Dramatic Society; parts she played then are listed on pages 33-35. She also had small parts in the films, A Night to Remember and Violent Playground in 1958, and in television productions, 1984 (filmed in 1954) and Quatermass (1959). In 1958, too, she returned to the Roof Garden Theatre at Bognor Regis to play in House by the Lake with the Pendragon Repertory Company. Kay always continued to write plays. These were mostly one-act and with all-women casts, tailored to the needs of women's groups. Altogether, she wrote some thirty plays, mimes, monologues, and sketches. Several were published; others produced by Phil on a duplicator, after his retirement from the teamarket, and sold by mail order. Kay's work with Merton Park T.G. was similar to what she had done with the Sussex W.I.s. She gave lectures (such as `Drama', a costume recital) and directed productions of her own plays. In 1961 Kay formed a new company, the Bassett Players, from members of local T.G.s and the Wimbledon Repertory Players. Performing her play, According to Plan, in the Beckenham Drama Festival, they won first prize for the Best New Comedy. Two years later the Bassett Players performed another of her plays in the 1963 Beckenham Drama Festival - Family Reunion. Her press albums (two, beginning in 1947) include programmes for many productions of her plays by W.I.s and T.G.s. Her version of Cinderella, in verse, written for Merton Park Afternoon Townswomen's Guild, was first produced by them in 1960. In 1965 the Gloucester Evening Townswomen's Guild presented According to Plan in the Gloucester County One Act Play Festival, and Harpenden T.G. performed Full Steam Ahead. Sussex did not forget Kay after her departure: in 1969, Felpham W. I. performed her The Little Heir. In 1970, two of her plays were performed at the East Sussex Federation of Women's Institutes County Drama Festival: Full Steam Ahead by Newick Green W. I., and Red Letter Day by Herstmonceaux. At the Gloucester Federation of Women's Institutes' One-Act Drama Festival, also in 1970, Kay's play about Sarah Churchill, I Shall Not Cease, was performed by Woodlands and Warden Hill W.I. In 1973, and again in 1974, three Felpham W. I.s presented an evening of "Kay's Comedies": Show Business, Full Steam Ahead and Family Reunion. Beginners, Please was produced in 1978 at the Plymouth and West Devon Federation of Townswomen's Guilds, by Milehouse. Merton Park T.G. produced Showbusiness and Bowled Over in 1984. Kay wrote of women's organizations as well as for them. Two of her comedies, Full Steam Ahead and Welcome to the W.I!, are set in women's organization meetings. Something To Celebrate (a three-act play) is about preparations for a T.G. Open Day, and won the National Townswomens' Guild play competition in 1978. She also wrote articles, some of which appeared in the T.G. magazine, The Townswoman (three of them are quoted here, by permission); one in Punch. After retirement, in 1993 Kay and Phil moved to Hatfield, Hertfordshire, near to their daughter, where they celebrated their Diamond Wedding. Phil Macaulife died in 1994, aged 91, and Kay in 1995. She is the subject of the book, Kay Macaulife: Women take the stage edited by Hazel K. Bell (Anna Brown Associates, 2003). "Had she been born fifty years later, Kay Macaulife, with the opportunities available to women from all kinds of background, might well have become another Lynda La Plante. In the context of her time, she created for herself a pretty full life, ending it with a list of achievements that most of her contemporaries would have been proud to boast." 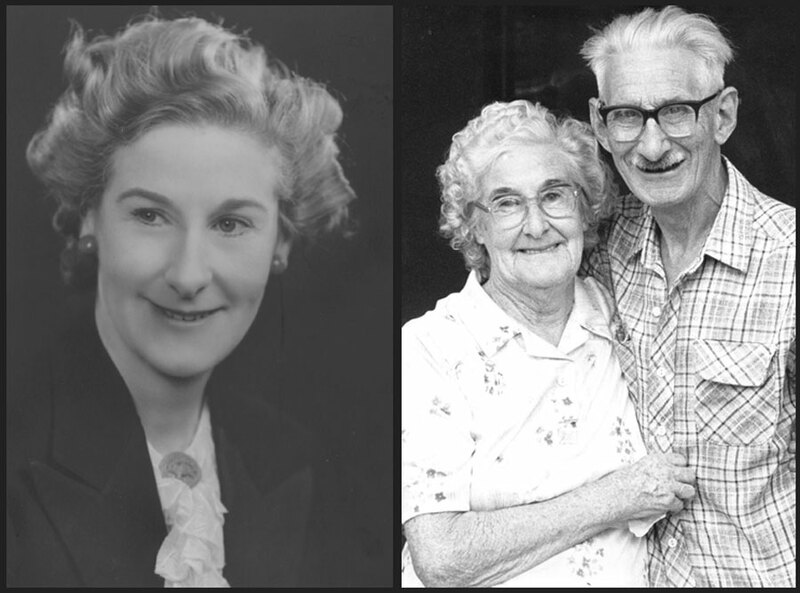 The photographs above show Kay Macaulife when she was with the Bognor Regis Repertory Theatre in the late 1940s, and with Philip at their Golden Wedding Anniversary in 1983.